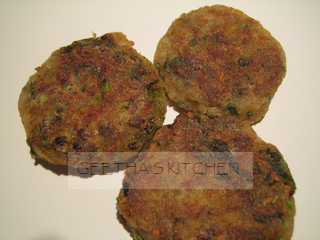 Aloo Tikki are a favorite snack all over India. Eaten with a little chutney or with protein-rich pea or bean curries, they make a filling meal. As evening approaches, snack vendors get ready with their array of patties sizzling on the griddles waiting for the crowds of people stopping for a late afternoon snack and offer combos such as Ragada-Patties in Western India and as Chole - or Chana -Tikki in the North. 12 Tikki - Allow 2-3 tikki per serving. Make shallow cuts around the middle of each potato (this helps to peel them quickly); cook them whole in water to cover or in a pressure cooker until done. Peel the potatoes while still hot. Mash them coarsely, stir in the onions and peas; let cool. Add ginger, chili, cilantro, salt, rice flour and lime juice to taste to the potatoes and mix well. Divide into twelve portions and form the potato mixture into patties. Dredge each patty in the flour and shake off any excess. If made ahead, chill up to 2 days. Cook the patties slowly with a bit of oil on a griddle or skillet until golden brown on both sides. 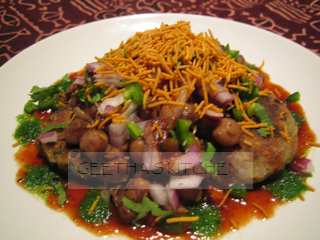 Serve hot with green and sweet chutneys or Chole/Ragada.